Shirts With Random Triangles: CBS will have a "Johnny Cam" on Johnny Manziel throughout the Alabama-Texas A&M game. 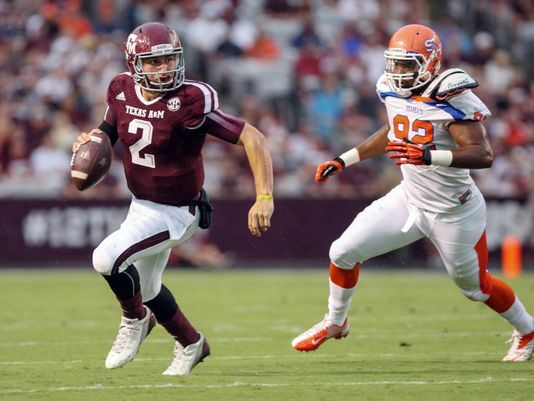 CBS will have a "Johnny Cam" on Johnny Manziel throughout the Alabama-Texas A&M game. CBS plans to have a camera on Texas A&M starting quarterback Johnny Manziel throughout next Saturday's Alabama-Texas A&M game. What could possibly go wrong here? The "Johnny Cam," as it's so unshockingly named, will keep track of the Heisman Trophy-winning QB "No matter where he is and no matter what part of the game it is," according to CBS coordinating producer Craig Silver. So if JFF pick his nose, you'll be the first to know. Silver will also said that CBS won't be rehashing the whirlwind of controversies surrounding Manziel, saying "We are not judge and jury. It is not our place, especially within the body of the broadcast, to state whether he should or should not be playing, should have been suspended or should not have been suspended. The way I approach it is how has all this stuff affected him as a football player and affected his team." CBS has also reportedly request to interview Manziel, who has been kept under media lock and key by Texas A&M. Expect some fierce competition with ESPN, who will bring College GameDay to College Station for the game.